Happy New Year and best wishes to all! I wish also to meet less cases like this below which i would like to get your advice/comment about. 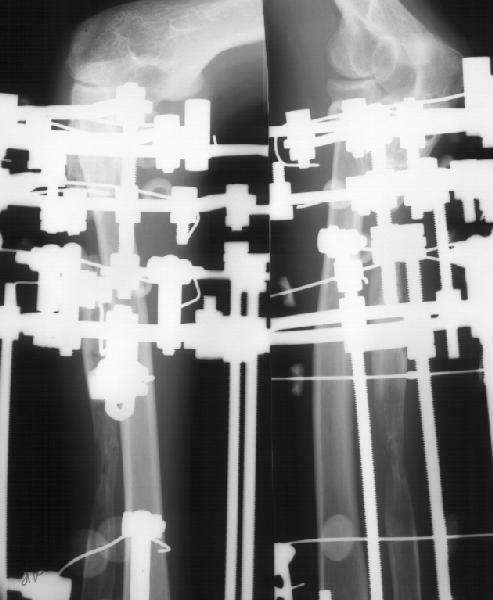 A male 34 years old had open elbow fracture in April 1997 which was plated elsewhere 2 weeks later. In Jan 1998 and Jan 2000 bone autografting was performed. Both grafts were dissolved. Since Dec 2001 the patient has been managed in our institute. 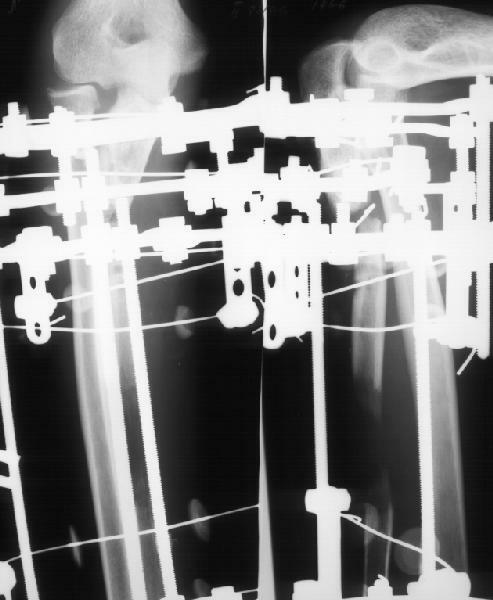 Jan 2002 the plate was removed, resection of bone ends and osteotomy of the distal fragment were performed. Then gradual traction started 0,5 mm/day, with 10-15 day pauses. The temp was decreased to 0.25 mm/day due to poor regenerate response and distraction finished at July 2002 (image left). Recent film, Dec 2002 (image right) shows lysis of bone ends and slow maturing of the regenerate. There was no sign of infection. Blood analyses are calm. How would you recognize the situation? Which further managing program looks most effective? THX in advance and Happy New Year again!